CALGARY, Alberta, September 5, 2018 – Lithium Chile Inc. (“Lithium Chile” or the “Company”) is pleased to provide an update on their current drilling program. Based on strong indicators from their first four exploration holes on their Ollague prospect, Lithium Chile has been approved for a fifth hole that will extend the drilling depth from 250 meters to 500 meters. Four exploration holes were originally planned and have now been successfully completed at Ollague. Results from the first hole were disclosed in a News Release dated August 23, 2018 and results from the remaining three holes are pending. Lithium Chile encountered grades in the brine in the first hole ranging up to 480 mg/l lithium with grades steadily increasing from 120 meters to its final depth of 300 meters. The first and second holes were drilled on the edge of the Ollague salar while holes three and four moved into the center of the basin. Holes 3 and 4 were completed to a depth of 250 meters and were still in a porous brine formation when drilling was suspended as per the surface rights contract negotiated with the community of Ollague. Data collected at the drill sites indicated high salinity brines beginning at approximately 150 meters and open at depth at the time drilling was suspended. Based on these indicators, Lithium Chile has made the decision to pursue a 5th hole in the center of the basin and north of holes three and four. Surface access has been successfully negotiated resulting in road and pad construction being completed over the past weekend with drilling planned to commence on Tuesday, September 4th. The top 50 meters of this fifth hole will be cased with a surface casing to prevent up hole caving and to reduce the amount of contamination of the deeper brine targets from near surface freshwater zones. The target depth on the fifth hole is 500 meters which will allow Lithium Chile to test the deeper levels of the salar. Steve Cochrane President and CEO of Lithium Chile commented: “Drilling a fifth hole at Ollague not only reflects the encouraging data we have collected on our first four holes but also reflects our belief that Ollague has the potential to be an exciting new lithium discovery”. 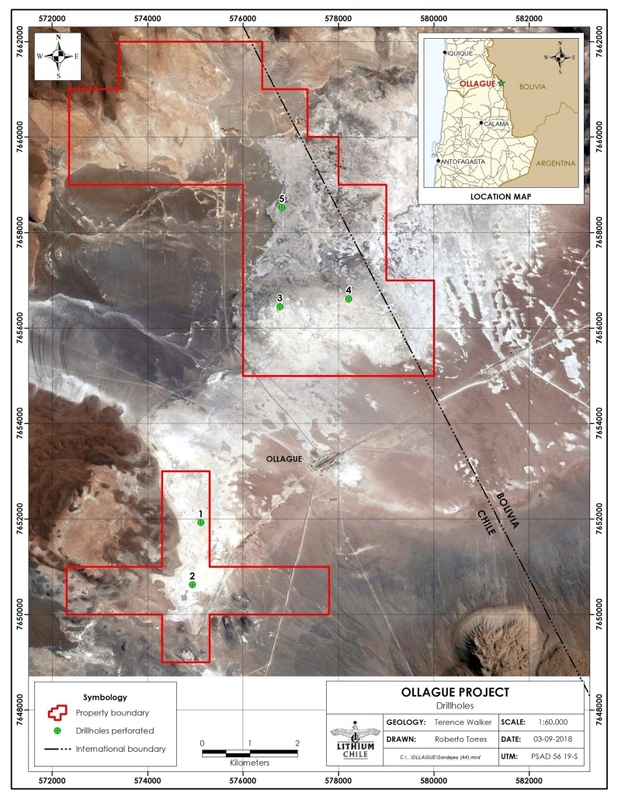 Lithium Chile is advancing a lithium property portfolio consisting of 155,800 hectares covering sections of 14 salars and 1 laguna complex in Chile. To find out more about Lithium Chile Inc., please contact Steven Cochrane, President and CEO via e mail: steve@lithiumchile.ca or alternatively, Jeremy Ross, VP Business Development, at (604) 537-7556 or via email: jeremy@lithiumchile.ca . This news release may contain certain forward-looking information and forward-looking statements within the meaning of applicable securities legislation (collectively “forward-looking statements“). Generally, forward-looking information can be identified by the use of forward-looking terminology such as “expects”, “believes”, “aims to”, “plans to” or “intends to” or variations of such words and phrases or statements that certain actions, events or results “will” occur. In particular, this news release contains forward-looking statements relating to, among other things, management of the Company’s views regarding the current and subsequent drilling programs. CALGARY, Alberta, June 28, 2018 – Lithium Chile Inc. (“Lithium Chile” or the “Company”) is pleased to announce that it has commenced a four-hole drill program at its Ollague project in Chile, where a recently-completed sampling program encountered lithium brines assaying from 160mg/l to a high of 1220mg/l. Holes will be drilled to a minimum 250 metres (m) or deeper based on drilling conditions and brine content. The drill rig will run 24 hours per day. Drilling will focus on high priority conductive targets identified in the recent transient electromagnetic survey (TEM) (see news release dated April 3, 2018). The survey indicated these conductive units to be open-ended horizontal zones varying from 20 to over 200 m in thickness and within 20 to 120 metres of the surface. The company believes these low resistivity zones reflect saline aquifers. A recently re-entered 110m deep water well just outside the property border was flushed, allowed to recharge then sampled. The brine samples that were collected, contained 1220 mg/l of lithium. 3500 hectares on the Salar de Ollague. Located near the town of Ollague and close to infrastructure. Comprehensive sampling program has encountered near-surface lithium brines assaying from 160 to 1220mg/L lithium. Testing has shown good chemistry, which is an important factor in economic lithium production (Li:K ratio 0.1:1, Mg:Li ratio 7:1). The property-wide TEM geophysical survey has identified multiple, large, high-priority target areas. Recent, old water well sampling has encountered subsurface lithium-bearing brines assaying 180 to 1220 mg/l lithium. Data collection will include lithology and depth-specific geochemical samples. Brine sampling will be completed using both drive point and hydraulic double packer systems, which have been tested and proved to provide a true depth-specific sample in addition to flow and porosity characteristics. Upon completion of the initial four-hole Ollague drilling program, it is the Company’s intention to complete a similar drilling program of four holes on each of the other four advanced projects, all in continuous succession, such that drilling is expected to continue for until late into Q3, 2018. This news release has been reviewed by Terence Walker, P. Geo., Vice President of Exploration of the Company and a qualified person as that term is defined in National Instrument 43-101. Lithium Chile is advancing a lithium property portfolio consisting of 152,900 hectares covering sections of 14 salars and 1 Laguna complex in Chile. The properties include 64 square kilometres on the Salar de Atacama which hosts the world’s highest concentration lithium brine production and is currently the source of approximately 30% of the world’s lithium production. Lithium Chile’s common shares are listed on the TSX-V under the symbol “LITH” and on the OTC-QB under the symbol “LTMCF”. To find out more about Lithium Chile Inc., please contact Steven Cochrane, President and CEO at (403) 853 7117 or via email: steve@lithiumchile.ca or alternatively, Jeremy Ross, VP Business Development, at (604) 537-7556 or via email: info@lithiumchile.ca.